Taking time off is a great way to step out of “the norm”, it allows you to have some good times with your friends and family. Leaving our humble home in England for a few weeks, we ventured out to Toledo, OH to visit our friends and family in that area. 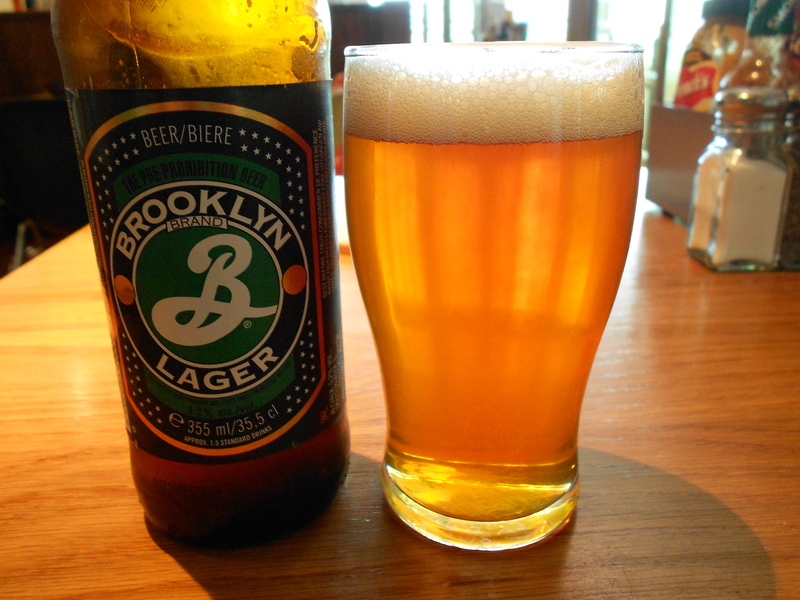 During that time, we were able to drink a lot of our favorite American beers that are hard to come by or can’t get in England. Such as Yuengling, Sierra Nevada, Maumee Bay Brewing Company, Dogfish Head, Great Black Swamp Brewing Company, Great Lakes Brewing Company, and several others! But more importantly, we got to spend some valuable time with our friends and family that we haven’t seen for quite some time. It may be a surprise to some, but the Toledo area has a lot to offer in regards to great places to go out and enjoy a pint of beer! Besides the classic sports bars like Frickers and Buffalo Wild Wings, there’s amazing places like the City Tap in Bowling Green, OH. The City Tap is located downtown Bowling Green and has a wall of beer taps ranging from big names like Sierra Nevada/Samuel Adams to local craft beers like Great Black Swamp Brewing company/Maumee Bay Brewing Company. My best friends Manny, Brian and I were given the opportunity to go to the City Tap one Saturday night for a guys night out and had a great time there. 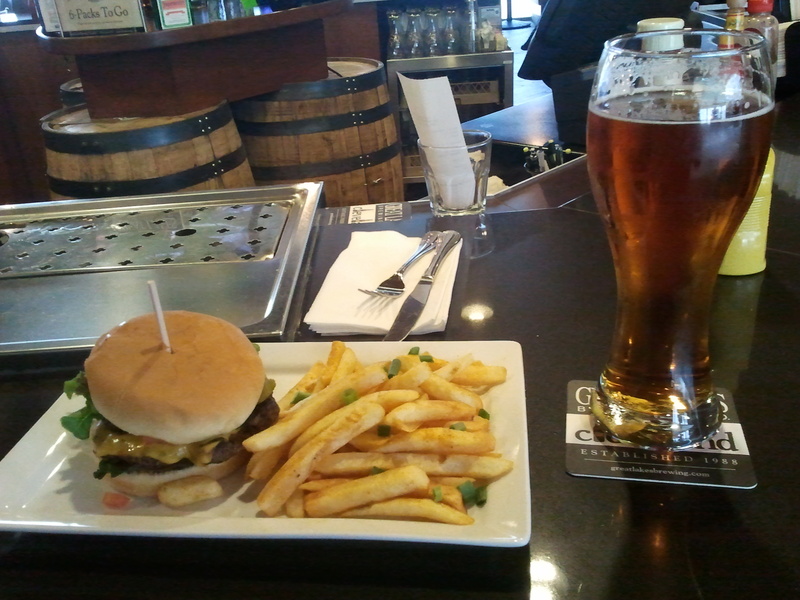 Unfortunately, I had such a great time at the City Tap…I completely forgot to take any pictures while we were there! The atmosphere was great and it was easy to carry a conversation with other people at your table. They have several pool tables downstairs to play on if you’re into pool. They also have an upstairs, but we didn’t bother going up there since the bar was downstairs. The bathrooms were my only complaint, I had to wait 15 minutes to take a piss everytime I needed to go. 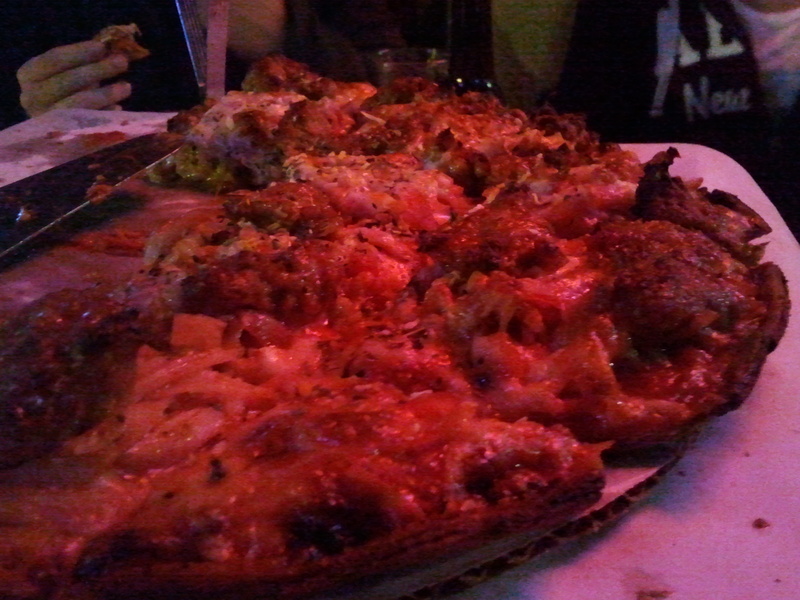 All-Meat Pizza from the Village Idiot! 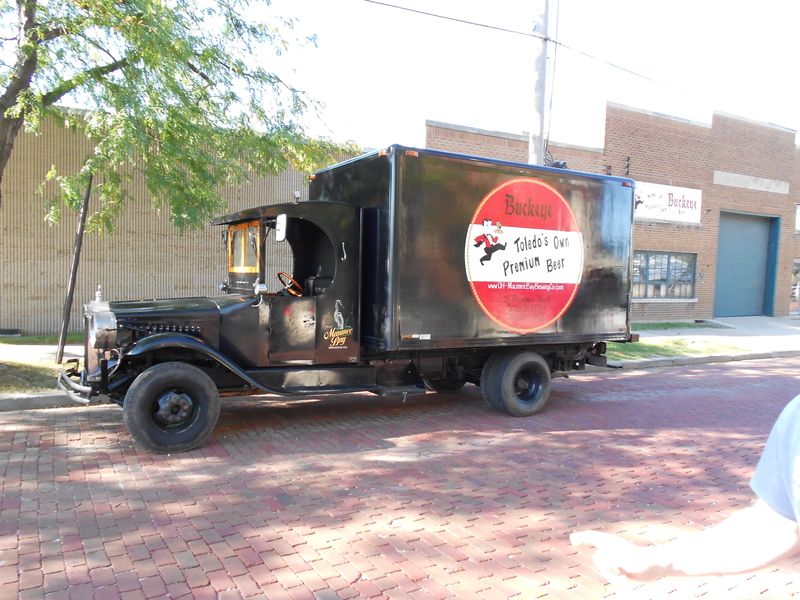 Another great place to visit in Maumee, OH is the Village Idiot! If you’re looking for a great slice of pizza, great music, and some good beer, the Village Idiot is your weapon of choice. Located on the main strip of Maumee, this place is Maumee’s best place to hang out at. But beware, the Village Idiot isn’t your typical pizza bar that you’d expect. Their menu is located on the back wall where you order your pizza at. The only price that’s listed is a plain cheese pizza which starts at $9.99, so if you order two all-meat pizza’s it’ll run you $27.00 even. The Village Idiot has a lot of beers to offer on tap and bottled, they have beers for all beer-drinkers alike…from the simple Budweiser fans to the avid craft beer drinkers. If you’re into live bands, the Village Idiot usually has musicians perform several times a week, ranging from folk music to rock. If you’re looking to try the local breweries within the Greater Toledo area. 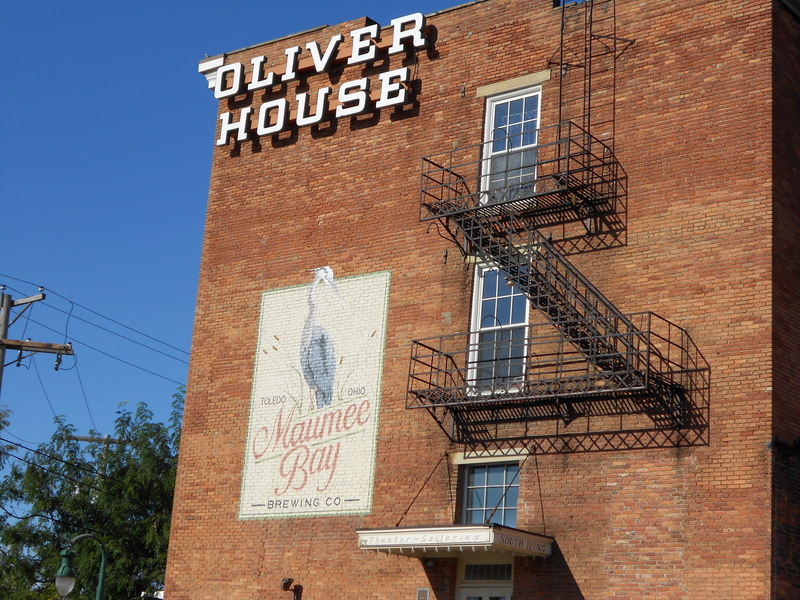 You don’t have to look very far, located within the Oliver House, the Maumee Bay Brewing Company (MBBC) has some of the friendliest staff that I’ve encountered in the Toledo area. My good friend Brian and I went there for lunch and to try some of their brews that have on tap. During our visit Brian had the Reuben sandwich and had their IPA, while I had the pulled pork sandwich and decided on the six 4 oz. 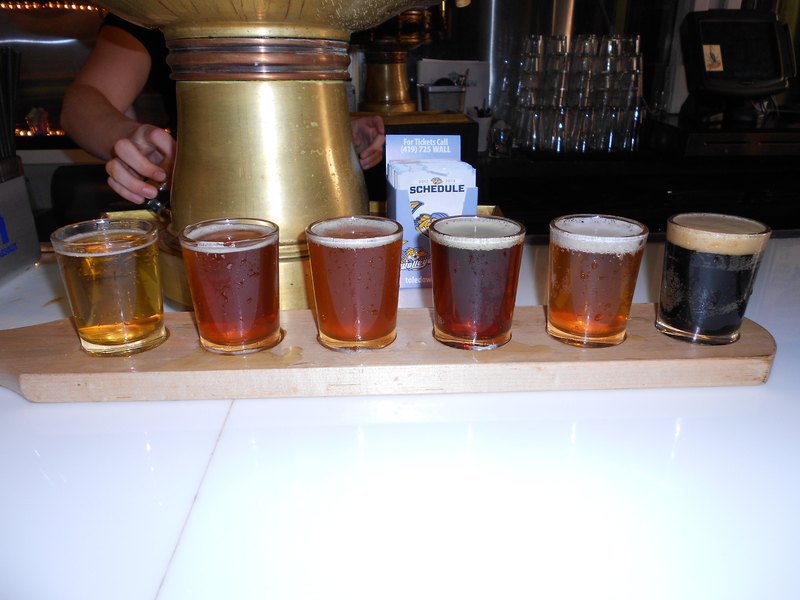 samples of their brews. Both of us enjoyed hanging out and conversating with the production brewer while he was on break. You should know that there are two bars located within the Oliver House..One is open during lunch hours and closes while the “downstairs” bar opens up. They both serve MBBC brews on tap and offer a small variety of other beer options by bottle only (Bud/Miller/Coors). The “downstairs” bar stays open until 2am and has a patio area available that is both beer/smoker friendly. During our trip at the Oliver House, Brian and I learned about the Oktoberfest event that were holding that very weekend. So we decided to get more information to see if it was worth going to. Unfortunately, Brian wasn’t able to go..but my Father and I decided to go for a couple of hours. We decided to eat when we first got there and had a couple of their hand-tossed pepperoni pizza’s they had on special. Their pizza was very delicious and we tried their German-inspired beers they had on tap for the Oktoberfest event. Their Hefeweizen had so much potential, it was way undercarbonated to fit that style of accordingly. It had the banana-clove-bubble-gum like flavors that any Hefeweizen should, but it lacked the carbonation to give it that carbonic acid bite to counter the sweetness of the beer. Their Oktoberfest they had available was a total let down and a horrible interpretation of that style of beer, it was far too bitter and hoppy. According to the BJCP for that style of beer, that’s very inappropriate. 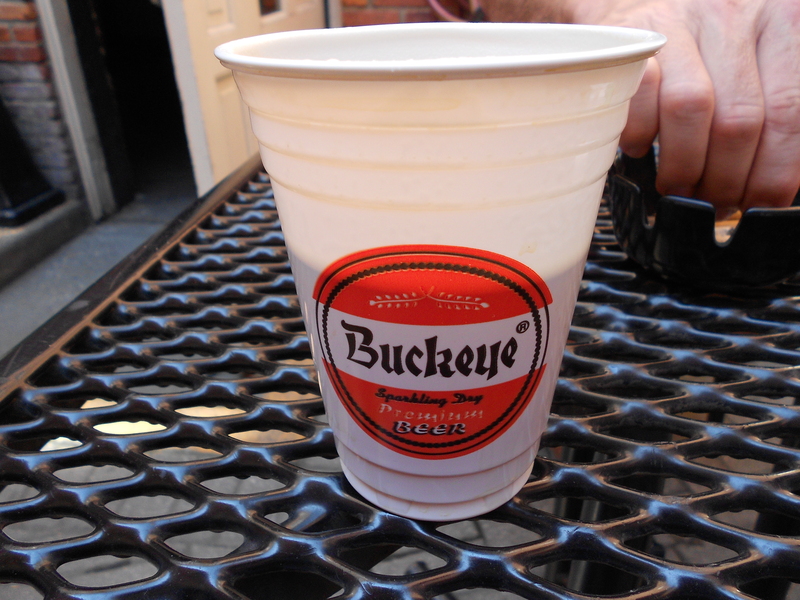 However, I did really enjoy their Dortmunder they crafted. Out of all the German-inspired beers MBBC had available, I will say that the Dortmunder was the best. 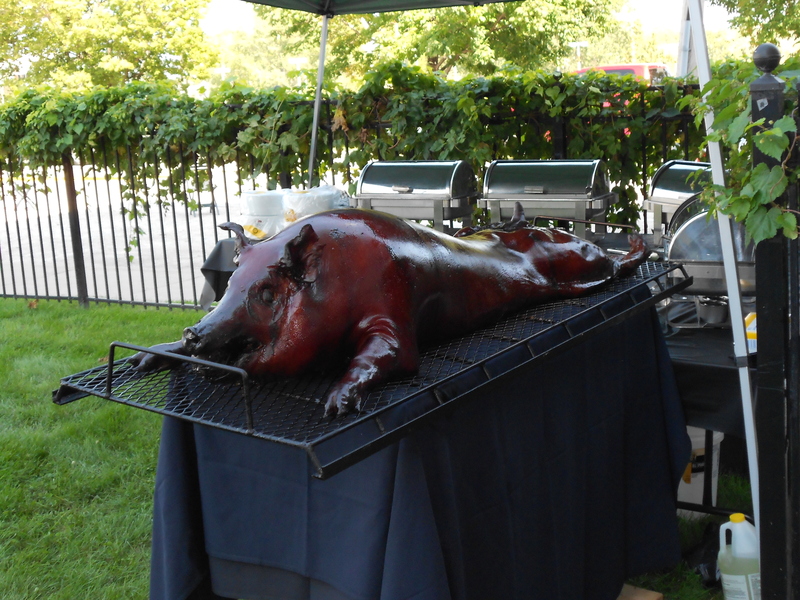 I didn’t get a chance to eat the pig roast they had available, for I was too full from the pizza and beer we had earlier. I also didn’t get a chance to hear the folk band they had hired to play at the event. So I felt bad having to leave so early but we had already been there for several hours and needed to get going by the time the band was getting ready to play. If you’re looking for something entirely different and unique. I highly suggest visiting the Irish Pub inspired Paddy Jack’s restaurant & bar. 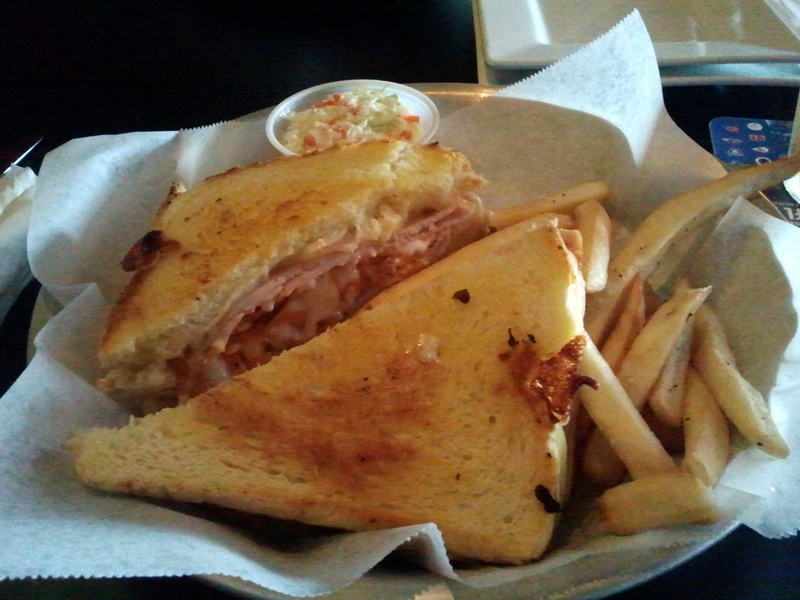 Paddy Jack’s specializes in gourmet style grilled cheeses and has a large variety of beers from all over the globe. My sister Lacie and I went to Paddy Jack’s to eat there for lunch one day and we had some of the best grilled cheese sandwiches we ever had in a long time. Their portions are very generous for their price and their staff is extremely friendly as well. Wearing long white-stockings and plaid skirts the waitresses ensured our drinks were never empty and displayed excellent service to both my sister and I. They have so many TV’s available around the restaurant/bar area that it’s impossible to miss your favorite sports team play! One last place that I recommend visiting while in the Greater Toledo area is The Blarney. 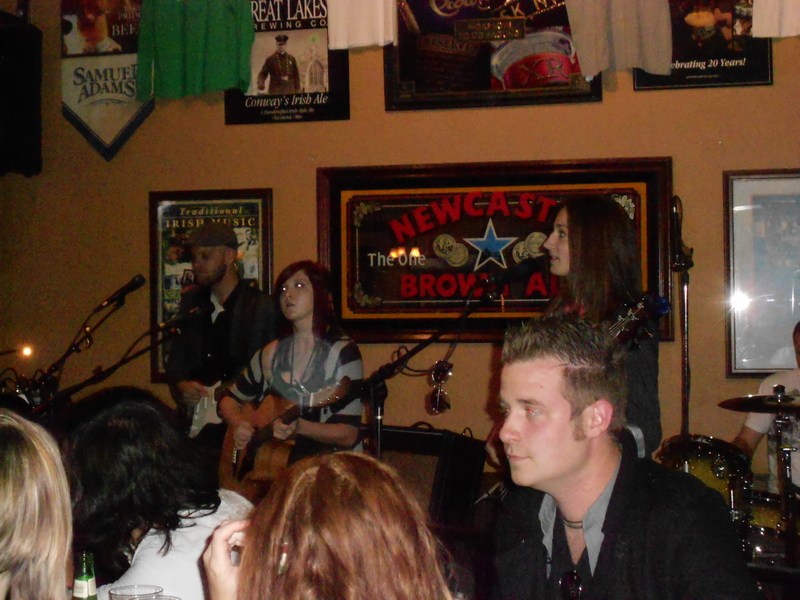 My sister’s friend was performing on stage that night and they were an excellent cover band to listen to. I do not recall the name of their band at the moment, but once I get that information I will have it available ASAP. The Blarney is a Irish Pub inspired restaurant/bar, it’s located downtown Toledo and has an outstanding selection of Irish beer, whiskey, and domestic/craft beers available on tap or bottled. Their food was exquisite, although I originally opted for their ribs…but they were fresh out by the time we got there. So I got their sliders instead, which were very tasty! My only complaint that evening was our poor waitress had so many tables that she didn’t come around as often as we would’ve liked to order more beers…which is understandable. Overall, I recommend visiting The Blarney to get together with your good friends and family to raise a glass or Guiness or Whiskey together while watching a good band or eating dinner. Click to follow our brewery and notifications on upcoming special offers by e-mail!